My daughter slept in her Rock N’ Play next to my side of the bed for the first seven months of her life. 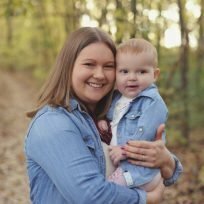 First, I was breastfeeding on demand and it was just easier, and second, I had horrible postpartum anxiety and the thought of her not being right there would get me all worked up. She took her naps in her swing and by god if that wasn’t the most important piece of baby equipment we owned. Every few hours, I’d stick her in there and she’d rock to sleep and I could do things that made me feel human, like shower and eat Cheetos without dropping them on her head. But then the worst happened. She started to outgrow both the swing and the Rock N’ Play and my life as I knew it was over. I had no plan. She needed to be cradled when she slept, and rocking lulled her to sleep. So like anything a type A person does best, I researched. I took notes. It was trial and error for a bit, but then I finally got a (written) plan in place. This is what I did to make the transition to her crib, and it’s my own. It’s not going to work for everyone, but maybe it can give you some ideas. I chose to do naps first, before tackling the night routine. Seriously, don’t attempt both unless you have no choice, because it will only cause stress for you both. Whatever your baby sleeps in, a swing, Rock N’ Play or bassinet—start out by simply putting it in your baby’s room for naps. The swinging and whatnot continue, but the environment will be different. 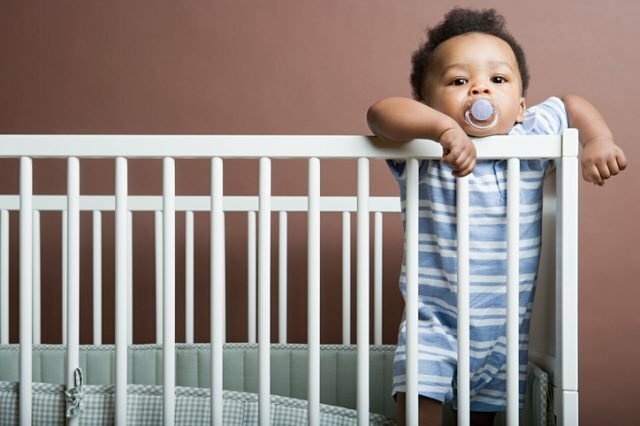 During this time, if you haven’t already, start putting your baby in the crib during non-sleep times while you’re putting away laundry, or cleaning, or just sit and read a book. Give them little moments to be in there while you’re in the room with them because their crib should be associated with good feelings. After about a week of these naps, if you’re using a swing or bouncer that moves, turn it off so they are laying still. This is when I starting using her white noise machine normally reserved for at night. Let them get used to sleeping without the swaying. After another week or so, lay them in their crib for their nap. Try to keep everything else the same, whether you sing to them, or use a sound machine. If they cry for you, pick them up. Yes, pick them up. The point is, you want to show them their crib is a safe place. If they’re crying and distressed, they’ll start associating the crib with negative feelings. No bueno if that’s where you want them to end up sleeping at night. So pick them up and put them back in the swing or rock and play for the duration of their nap. Try again at the next one. This could last a few weeks depending on how you both feel. The goal is to get them to sleep longer and longer stretches in the crib until they can consistently last the whole time. Again, since the whole point of this is to transition gently, make sure they’re mostly comfortable in their crib before you attempt a night routine. If you haven’t come up with a good bedtime ritual, now is the time. Bath, pajamas, book, and singing or prayer all can help wind down your baby and let them know it’s time to sleep. Just be sure that it’s all done in their room. If you’re nursing, start nursing in their room. Read books and change their diaper in there as much as possible to show them that this is their space. We always started out the night in her own room and if she woke and cried during the night, I brought her to bed with me, something we had usually done anyway. Again, the crib needs to be a positive place. When nursing at night, do all sessions in their own room. It wasn’t a long transition for us. I knew with my anxiety and knowledge of developmental stages, I needed something gentle on the both of us. Like any transition (I’m currently potty training a toddler—the fun seems to never end), it takes work and an overabundance of patience and routine. Now is not the time to take that trip or, you know, move across the state. But with us, the consistency paid off and she became a pretty good sleeper. Of course, then we hit another transition of a big kid bed and all my careful planning went out the window. Because parenting.